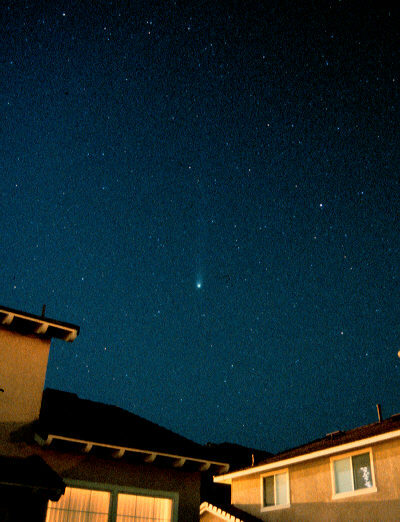 Comet Hyakutake was the first great comet since Comet West in 1976. Although its large coma could be seen from light-polluted locations, its long gas tail could only be fully appreciated from dark-sky sites. Making it easier to view was the fact that it was an evening object, located near the north celestial pole, which made it visible for most of the evening and early morning to northern hemisphere observers. In terms of physical size and activity, Hyakutake was a rather ordinary comet, but it put on a spectacular display because it passed extremely close to Earth, within about 0.1 astronomical units. Some experienced comet observers, including John Bortle and David Levy, have said that Hyakutake was the most impressive comet they have seen. Technical Notes: This photograph was taken from my backyard. My house is visible in the left foreground; light coming from the street shone into my living room, which lit up the windows facing the backyard, even with the blinds drawn. Fortunately, however, the streetlight directly across the street was not working at the time, which helped somewhat (the light was repaired in time for Comet Hale-Bopp, though). Skyglow limited my exposure time, but fortunately the northern part of my sky is fairly dark.